This is not my typical style of a blog post, instead, it is an personal narrative. Earlier this year I took an 8-week writing class. Our assignment: write about an experience that changed your life. This is what I wrote. While my closest high school friends never considered attending college far from our southern roots, I could hardly wait to break free and bounce to Bloomington, Indiana, the home of Indiana University. Due to our new distance, as best friends we rarely shared face-to-face conversations and all necessary news between us traveled via miles of phone lines. It was November 22, 1997. I was at home watching TV while one of my roommates was studying in the room next to mine. The home phone and answering machine were in my room so I was always the first to answer. Like any other day, it rang in the same tone, giving no clue to the life altering news I was about to receive from one of my best friends since the age of 12, Margaret. With frightened tears breaking through her words, she managed to muffle the horrible news that our beloved high school bestie and partner in crime, Meredith, had tragically died that morning. I recall sitting down on my queen sized bed for support, screaming into the cordless phone, shaking with disbelief, crying from confusion and questioning what she was saying to me. Being that it was late November, I’d talked to Margaret the week before about my upcoming trip home for Thanksgiving. Though it meant skipping class, I’d reserved a flight to a land a few days before the holiday, guaranteeing more friend time. As if my subconscious was one step ahead of my reality, I’d now be back in town in time to attend Meredith’s funeral. It’s crazy what’s discussed among best friends when one of your own, dies. I recall shortly after Meredith’s funeral, gathering with my girlfriends on Margaret’s kitchen floor, drinking bottles of red wine, crying through our laughter as we story swapped about her hilarious drunk dance moves and the sweet way she stepped up to the plate for any one of us, anytime we needed a smile. We also dove into the dark side and discussed things we never imagined would ever be whispered. We disliked the amount of makeup painted on her open casketed face. Or the royal blue blazer that draped over her upper body. We thought Meredith would have worn her favorite color, red. Not to mention, the flowery music sound tracking the funeral service. If asked, we’d have picked Bone Thungs n Harmony, Crossroads, never doubting Meredith’s spirit would be dancing along, waving her arms in the air, rallying us all to join. But even stranger were the personal demands we each took turns revealing, on the unexpected chance we also died suddenly. Margaret insisted each of us promise we’d go to the mortuary for the preparation of her body to oversee her makeup application, laughing that no mortician would think to cover up the birthmark she loathed on her upper lip. Sarah McLaughlin’s “I will remember you” would be her song, and yellow roses her flowers. To lighten the mood, I made Margaret promise I could take her GAP cargo pants and Banana Republic sweater I seemed to borrow on a weekly basis. Fast forward 9 months later, July 26, 1998. Never could I have fathomed that it would be Ryan’s turn to call me, her reason piercing a jagged knife through my already fragile world with the words that Margaret, better known as Marge, had also died. In a tragic car accident. Only 10 months had passed since Margaret told me about Meredith. According to those who witnessed what happened next, I violently collapsed to the floor, screaming from a place of unimaginable sorrow, arguing with Ryan to stop with her nonsense, insisting her story was a lie, my body weeping with grief. Hearing “Margaret is dead” could not be. Statistically speaking, I thought about the odds of 2 best friends dying, separately, within the same 12 month period. The probability of it being possible seems preposterous,¦ until it actually happened. I’ll never forget the day I lost Margaret, just as much as I’ll always remember the day we met. It was the first day of 6th Grade at Greenville Middle School. Both our elementary schools combined to filter into one new school, which meant new opportunities to make new friends. Since her last name was Stewart and mine Shaw, we were alphabetically assigned to the same Homeroom. Rocking a bright yellow cotton skirt covered with colorful flowers and a red t-shirt, short sleeves rolled up showing off the reversible yellow color on the flip-side with my brand new KED sneakers. I thought I was cool. That is, until my eyes landed on the freckle faced girl to my right, wearing dangling gummy-like neon green fish earrings that danced as she turned her head over her shoulder to chat with the boys behind her. And… I was in awe. She… was cool. After introducing myself to this girl I hoped to be my new friend, I quickly learned the neon fish had names, Fred and Ted. Over the next 8 years our friendship would consist of countless sleepovers, the joy of puberty, first kisses and first heartbreaks, summertime poolside escapades, many late night alcohol induced house parties and memory making road trips, including one of our favorites, the time we failed to show up to our pre college PSAT because we slept sitting up in a car filled parking lot post Pink Floyd Division Bell Tour in 1994. One for the books! This was right around the time Marge and I branched out from our classmates and into our rivalry scene. By now we were in high school, Margaret and I attending Eastside, while Meredith, Ryan and Nicole went to Riverside. Only 5 miles apart, the distance was no factor for our friendship. Everyone in both schools knew we were all the best of friends. In fact, by Senior Year our 5 friend get along gang was so tight, Margaret and I opted to be a part the Riverside Senior Yearbook Page, rather than our own. It helped that Ryan was the decision maker on the Newspaper Committee, sneaking our personal pictures into the approved final edition. The evidence of young green grass emerging from around Meredith’s recently engraved head stone that looked on while Margaret’s casket was lowered into the newly unearthed ground to the right of her, captured the timeliness of their deaths. No one could argue the eerie coincidence that the uncovered cemetery plot seemed to be waiting for Margaret as a final resting place alongside her forever friend. Looking back, the similarities of their fatal accidents lend the horrific story to feel almost purposely poetic. Both were driving their own cars, with no additional passengers. Neither crash involved another vehicle. Both accidents occurred around the same early hour of 3 AM on a Sunday morning. Both were en route to their own family homes in our hometown of Greenville, SC. Meredith, about an hour away, planned a last minute visit to attend the first Sunday Service at her family’s newly renovated church. Margaret, who was already in town and only had to travel 3 miles, chose to leave a post wedding sleepover party, with the intention of a head start on her studies for a summer school statistics exam she planned to ace the following day. Though Meredith didn’t have an opportunity to attend the first church service under the newly constructed roof, she did have the honor of being the first funeral, one week later. I stood on the kitchen step stool I brought to my bedroom, stretching myself to reach the closet shelf and hoisted down the photo box containing random snippets from my life I decided were worth keeping at arms reach. At the age of 28, I loved spending the afternoon with the occasional trip down memory lane. Every time I rummaged and reminisced, I expected to excavate the same artifacts as the time before: the old picture of me rocking pig tails and hot pink pants, the mixed tapes gifted to me as farewell letters from my summer camp friends, my Milli Vanilli ticket stub showcasing my early concert career and some random hotel room keys reminding me of adventures with friends I’m lucky my parents never found out about. However, while diving into my memories this particular day, I came across a cassette tape that I knew for a fact did not belong to me. Curiously, my eyes examined the pale pink business card that was wedged inside the cover of the case. â€œWhere did this come from? Who did it belong to? Who was this Tarra lady? It was 2007. My roommate, Ellen and I, were living in a two story condo, 3 blocks from North Pacific Beach in sunny San Diego. This was the second address we shared since Ellen’s serendipitous phone call to my Dallas, TX cell phone number 3 years prior, to gently twist my arm. Her then roommate needed to move out, which meant the window to the West was wide open for me to pack my bags and move in. This was all it took! I put a flower behind my ear and headed west to California. Now, years later, standing with the cassette in my hand, I hustled down the hall ways, yelling down the flight of stairs for Ellen to come find me. Ellen’s eye brows raised and her jaw dropped as she stepped back with surprise of what I’d stumbled upon, Oh my god, I forgot about this! Where in the world did you find it? Trying to make sense of it all, I explained the questionable scenario that somehow her tape managed to find its way into a box of my belongings I rarely open. Though I felt dumbfounded, from the look on Ellen’s beaming face, I knew it was some sort of buried treasure she’d been missing. Little did I know I was blowing the lid off Pandora’s Box. This seemingly small discovery would be the catalyst of a big change in my own world. As it turned out, the clear cased tape was a one-hour recorded reading Ellen experienced in 2004, with Tarra, a Psychic Spiritual Medium from Sedona, AZ. After Margaret died, everything I believed to be normal was ripped out from under me. I walked on eggshells with the off chance I mentioned her name to mutual friends, creating a cold silence or blank stare. Of course I wasn’t the only one to lose her, but I was the one to lose my very best friend, the other half to my stories. Attempting to grasp onto any morsel of comfort, I immediately devoted night after night researching the afterlife, clinging to any insight to curb my chaos, to feel sane in the middle of insanity. Scouring the Internet like a little girl searching for information on her lost puppy, I grasped to stories of angels and their ability to commutate with loved ones. I explored uncharted areas of Barnes & Nobles, aligning myself with books that until now, I never thought to read. I was only 20, best friends were not supposed to die this young. Margaret and I talked a lot, most often while I drove around in my car. I was convinced she could hear me and, on occasion, I could feel her with me. Numerous times, as if on cue, moments after speaking her name or flashing back on a memory, the first beats of our song, “Boys of Summer” by Don Henley would trickle out my speakers, filling my car, and my heart, with her presence. I’d sing along, my heart racing, skeptical but oh so happy to believe she was riding shot gun by my side. All feelings aside, what really opened my eyes to the possibility of talking to my girls again was an episode of John Edward’s TV show, Crossing Over. I witnessed him hearing voices from deceased loved ones from beyond and connecting the voices with grieving families in the audience, somehow knowing intimate details only those that passed on would be able to relay. Every time a family member received a sense of peace, knowing the souls of their loved ones were safe. According to Ellen, Tarra, had the same gift as John. Not only could Tarra predict future events with her psychic abilities, but she spoke in the present with people no longer alive, sharing conversations with spirits. In learning this, finding Tarra’s contact information felt like a winning lotto ticket! This was exactly what I needed, a way to talk to them. If it really was possible to communicate with those on the other side, I knew Margaret and Meredith would jump at the chance to chat and be heard. Why? Because that’s what best friends do. Though I was skeptic and $350 for an hour-long psychic/medium reading felt like a lot of money, I did not hesitate one bit. I believed every dollar was worth the gamble to prove their spiritual existence. A lot of time had passed since I initially found Tarra’s card and tape. But, my intuition was firing off spot on signs to me over the past few months and I knew it was time to call her. It was now October, 2008. I remember the moment I found her info, the day Ellen explained Tarra’s s gift. That night I day-dreamed about what might happen if I called her, almost obsessing about the need to connect. But over time, I let go of the reigns to prove anything, perhaps scared of being let down, perhaps creating space for the perfect reason to reach out. And then, the time felt right. Since I had an upcoming Adventure to Peru around the corner, I thought it would be a good time to speak with someone who called themselves a Spiritual Medium, callingÂ from a place of curiosity and hope rather than desperation and need. As if by fate, the week I eventually called Tarra’s Arizona area code to inquire about a phone reading, happen to be the week before Tarra planned to be visiting San Diego to offer face to face readings with her usual California connections! I pinched myself with the crazy coincidence. Something had tugged at my heart and told me the time was right. If I’d waited a week, even a couple of days, to pick up the phone, chances are I’d have missed this opportunity. The only hour Tarra had available happen to be the following Monday, which happen to be the first day of my soon to be 10 week sabbatical. It felt like the stars were aligned, that our meeting was supposed to be happen at this point in time. A roundish woman standing no more than 5 feet tall, with a faded New Jersey accent and a consistent cough that lingered from childhood pneumonia, Tarra, opened the front door, embracing me with a warm hug and inviting smile. With the ease of two friends meant to meet, we shared small talk about the gorgeous home of her longtime friend, the picturesque coastal day and the fact that I was noticeably nervous. “Breath, you have to remember to breath” she said as she guided me from the foyer into the living room to a pair of comfy, crafted chairs set facing each other. Reaching to the side table, Tarra then handed me an individual package of Kleenex. Staring at them I asked, “What are these for?” Glancing at me, a slight chuckle in her voice, she assured me I’d need them soon. Next, she requested I hand over a small item of mine that I kept close to my person on a daily bases. I chose to give her my black opal ring I wore every day since my 3 month adventure to Australia in 2005. She then put this ring on her own finger, closing her other hand around it, taking in my energy. She asked if I’d brought pictures of loved ones that I wanted her to bring into our session. I pulled out my favorite picture of the three of us, the one taken at a pre party before our Senior Prom, and placed it upside down on the side table. Given the fact that I had a glass of white wine in hand, Meredith a bottle of Miller Light and Margaret a vodka soda, I always laughed at how our drinks in the picture personified our personalities at that time in our lives. Open to what was about to happen, I took a deep breath and closed my eyes as Tarra began recited a welcoming prayer, inviting all sorts of spirits to join in support for the session. She asked everyone from my angel guides and ancestors to Jesus and Moses to the dolphins and whales to offer guidance in the journey? Dolphins and whales? This introduction to the world of a Spiritual Medium was the tip of the iceberg. I knew Tarra was speaking directly to me, but her words came from some place other than her own mind. She wasn’t thinking the messages, she spoke with a stream of consciousness, conveying information meant for me and only me. Watching her eyes dance from side to side as she received wisdom from some unknown source, I soaked up her surreal words the second they left her lips. How did she know I’d left my job? How did she know I had MS? How was it possible for her to recite back the harsh words only me and the voice in my head were aware that I spoke, as if to hold a mirror to my soul, revealing details that were impossible to uncover. She knew things no one else knew. I’m pretty sure all the color drained from my face at the same time my eyes filled with tears. It was her. Margaret was known for her sailor mouth to the point that after she visited me in college our Freshman Year, my guy friends reference on how such a pretty girl could drop the F Bomb so much. This was really happening. They were really with me. I instantly began to feel the floor drop from under me as my eyes filled with tears, now grateful for the tissues I’d unknowingly been clenching tightly in my hand. In March of 1998, 9 months after Margaret died, while studying for a semester at Richmond College in London, England, I, along with 2 girlfriends, hopped on a plane for a quick 3 day trip to Dublin, Ireland to celebrate St. Patrick’s Day. Of course we had a blast. But I soon realized this getaway was more than just a reason to drink Guiness and wave our Irish flags in the massive parade. I couldn’t deny the overwhelming emotions. surfacing inside me as I walked the streets, wide eyed and loving life. For the first time since the death or Marge and Merry, I felt lucky. Somehow my awareness had shifted to realize that my decision to live life to the fullest and travel the world was a silver lining to their loss. I recognized in that moment had I not gone through all that I had, I wouldn’t have become depressed, that feeling of coasting through life. Out of my despair came my dream to do something I’d never dared before their death. Not to mention, I was in Ireland, on a all days, St. Patrick’s Day, literally surrounded by luck! I knew I’d found my pot of gold at the end of a faded rainbow. With this new perspective I immediately asked my friend if she would do me a favor. I needed her to come with me to get my first tattoo, something I had always wanted and now I felt the time was right. Permanent good luck inked to my body and honoring my best friends, defining this overwhelming silver-lining of loss and luck. 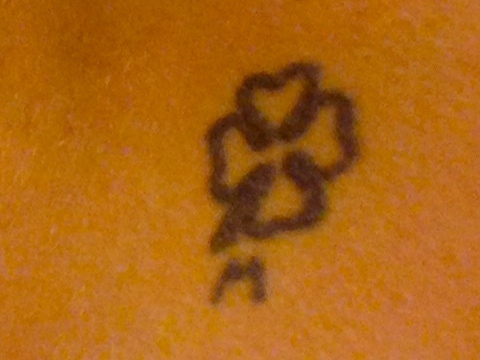 Fast forward 10 years later: here I was, sitting with a spiritual medium who would have no way of knowing that on the lower right side of my back I had tattooed a quarter sized four-leaved clover with the letter M. Thinking back on the day I spontaneously decided to get ink’d while in Ireland, I’d contemplated getting angel wings, but knew Margaret would consider it ‘cheesy’. Given the fact they shared the same first initial, an “M” seemed like the perfect way to honor them both. I purposely placed it lower than my jeans but high enough to seen on occasion However, I never anticipated how someone would respond if they did see iWithout fail, each time I’m asked, “what does the M stand for”, I smile, using the question as an invitation to talk about my best friends. I felt lucky to have them in their short life as well as I did. My tattoo made them my permanent good luck charms and granted their story permission to live on through me. My “M”s. In a matter of minutes, Tarra flipped my world upside down. No longer could I discount what I could not see. No longer could I question whether or not my friends spirits still soared, their souls vibrant and full of life. My tears now streamed happiness knowing that their death was not final, that their spirits still flourished alongside my adventures. Tarra fed me information about their accident from their point of view, assuring me my friends passed quickly, no suffering, no pain. I knew Margaret’s brain took the blunt of the accident, causing her instant death when she lost control of her Mazda XR7 that collided into a 10 foot long brick entrance to a neighboring subdivision, crumbling the structure past the point of repair. Meredith’s case was different. A Semi Truck driver caught a glimpse of her car off the side of the road, calling the police to report he’d found her body, in what an autopsy would later confirm was many hours after she passed. To this day forensic evidence is unclear how or why Meredith’s car swerved off the road into a pasture of green grass, ultimately hitting a tread head on. We were told the story that she fell asleep driving alone late on a dark night. But Tarra gave the accident a new spin, suggesting a deer jumped out, startling Meredith, causing her to lose control of the wheel, and without breaking, crashing into the tree. All of this information was enough evidence to confirm I not only got my money worth only what happened next was a true game changer. Tarra claimed Margaret had a message for me, about something that was going to happen in my future. Her words from Tarra, “due to you tendency to overreact, I need you to know, in regards to a future flight, your arrival time will be late, but everything is happening as it should” I looked at Tarra, bewildered. Having mentioned nothing about my upcoming 6 week excursion to Peru, Tarra brought up the fact I had 3 flights I’d be taking in my near future. She knew I was going out of the country. In fact, my flights booked would carry me from LA to El Salvador to Lima to Cusco. Somehow she knew I had 3 flights and needed to relay a message from my my dead best friend’s spirit that not only would one of my flights delay the arrival time to my final destination, but I was not to worry, as all would be happening as it should. Was she kidding? I didn’t know whether to worry about my trip or think all of it was crazy. It was one thing to provide messages of their safety from beyond the grave, but to insinuate a mess with my flight itinerary was a whole different ball game! After a brief moment of silence I began to hear her laughter roar from Lima, Peru to confused ear, â€œAre you kidding? Your flight landed an hour ago, you missed your flight… you actually missed your flight! '”  I froze and in an instant all the color drained from my face as my blood drained to my toes. “What? What are you talking about”, as I was completely confused! Was she suggesting I was in fact the reason my arrival time was delayed, rather than it be the fault of the airlines? Never in my wildest dreams did I imagine that I would be the cause of my delay, I naturally assumed I’d miss a connection or a flight would be grounded for maintenance. And then it hit me. Oh. My. God. My 2 AM flight did not leave on what I perceived late Sunday night but rather early Sunday morning! Somehow, my friend and I both managed to overlook the fact that in order for me to arrive on a Sunday afternoon, Iâ€™d have to leave late Saturday, which was really 2 AM Sunday, not 2 AM Monday, which felt like Sunday night. Frantically, I hung up with Valerie and promised her I’d email her once I found out my new options. Then I sat in my car. In the parking lot. Shocked yet at the same time giddy about the fact that what Tarra said that Margaret said was true! It was real! She was real. All of this was crazy but real. Just like Margaret predicted, there was no way I’d arrive in Lima on time. And just like she predicted, if I had not been given this insight ahead of time, like usual, I’d have read into the circumstances, easily convincing myself I was not meant for the journey. However, having this insight, I knew what I had to do. I simply had to make new decisions needed to get me to where I was meant to be. I immediately called the airlines, only to find out not only did I need to repurchase a new outbound flight, but that there was only one seat left on the flight.Â Trusting that all was happening as it should, I gave her my credit card number as if the new $500 charge was the punch line to a bad joke. But, I was safe. I would arrive a day later. On top of all this, the rest of my travel plans became obsolete in the moment as I realized I’d no longer be staying with Valerie my first night in Lima and additionally needed a new flight from Lima to Cusco, I then bought a second new flight. Everything was upside down but right side up at the same time. Margaret was right. It all worked out as it should- even better than originally planned. As a result of all that transpired from finding the cassette tape, my heart and mind were blown wide open to all possibilities. I could never “not know” what I now knew as real. Never again could I dismiss an idea, simply because I could not see it. From this point on, anything was possible. I look back in awe of the way it all played out, but also convinced each synchronicity of every circumstance was simply a puzzle piece to the bigger picture. What could possibly be was just as probable, if not more of an option of what I knew to be. I was meant to find the tape,Â from what I believe to be part of a divine plan, the tipping point that ignited my curiosity as well as my spirituality, in a way that truly is hard to put to words. Over a decade later I’m still pinching myself. And the best part is knowing that no matter how much time has passed, Margaret and Meredith will always my good luck charm guides. Why? Because why not, thatâ€™s what best friends do. Wow! This had me in tears. I miss my friends too. They are all alive but seperated. Wow. Just wow.